That each student studying in 746 primary schools run by the North Delhi Municipal Corporation (NDMC) is entitled to 5 subject copies + 1 drawing copy free of cost at the commencement of academic year i.e. April 01st. It is really shocking that 5 months have already passed, yet 4 lakh students studying in these primary schools have not received any copy. The funny reason appears to be that the tender has not been finalized. It is a matter of great national shame that the authorities running these schools are totally callous towards the education of the children of the masses. 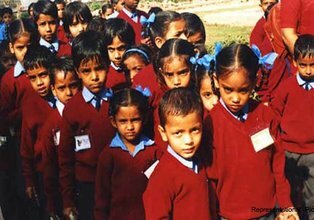 The inaction on your part is in utter violation of the right to education guaranteed to these students under Articles 21 and 21-A of the Constitution of India read with the provisions of RTE Act, 2009. Needless to say that time has come to implement the recent judgment of 18.08.2015 of Allahabad High Court ensuring that yours and other Govt employees’ children are compelled to attend these primary schools. It may also be mentioned here that failure on your part to provide copies to these 4 lakh students amounts to contempt of Hon’ble Delhi High Court as much as the High Court has directed you in the PIL to provide books and copies to the students in time. It may further be mentioned that under the provisions of RTE Act, 2009, it is the responsibility of the State Govt to implement the provisions of the said Act, but to great surprise, the Delhi Chief Minister, Shri Arvind Kejriwal does not at all talk about the plight of the 10 lakh students studying in primary schools run by the three Muncipal Corporations. I hope and expect that before you take the Hon’ble President of India on ‘Teachers Day’ to a Delhi Sarkari School, you would make available copies to these 4 lakh unfortunate primary school students of North MCD.